Sturdy board book - will hold up to little ones reading it! 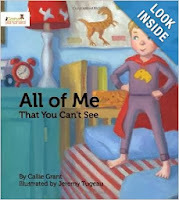 Colorful illustrations - as mentioned, I love the illustrations of the little boy in the super hero cape! The text of All of Me That You Can’t See starts out with; "When I look at me, I'm all I see. Two eyes, two ears, one mouth, one nose. But something else inside me grows. My heat, my mind, my strength, my soul." I love how this book helps a young child begin to learn about making wise choices and how there is so much more to them than the parts they can see! The publisher says, "Based on Mark 12:30, a young child discovers his inner self grows in Jesus right along with the rest of him. Help your child with his or her own discovery." All of Me That You Can’t See will give you opportunities for great conversations with your grandchildren! I'm happy to say, not only did the publisher send me a book to review, but they also are providing a mini-tote bag (sunglasses not included) the perfect size for a child to carry their favorite board book, for me to give away (USA only)! If you are 18 and older and would like to be in this drawing which will be on December 17, 2013, all you have to do is at least one of the following: follow on Google+, Google Friend Connect, follow by liking on facebook with the tab at this link (not just liking the post) and/or have followed grandma's cookie jar by email. For each of these which you have done you will receive one entry. In addition, if you "share" this post, you'll receive an additional entry (please let me know if you share!) This will help me be able to draw names from among people who would like to win the tote bag and it gives you several ways to enter the give-away! I follow by email, facebook and google+. I shared this on google+ and by email. Wonderful book to learn about what is in your heart. Gets a bit tricky trying to explain to the little ones what a soul is. Our boys love their capes, or Gumma's bath towels is what they use.